Cape Breton's newest scenic wonder. With close to 70 acres of Acadian forest and 2 healthy brooks, the 3 kilometer trails are ideal in all four seasons for walking, jogging or pausing to reflect on the wonders of nature. 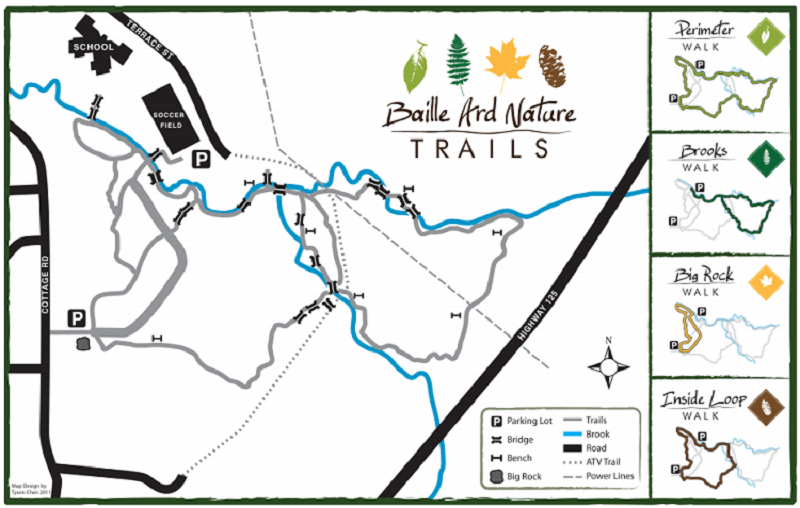 The main entrance for the Baille Ard Trail is located on Cottage Road, behind Sherwood Park Education Center, and is only three kilometers from downtown Sydney. The mission of our volunteer group is the continued development, maintenance and promotion of the nature trails in the wooded Baille Ard area in the South End of Sydney. Groups such as the CB Island Hoppers help us promote the trails as a venue for health and wellness through outdoor activity. Working with other community partners and schools, we educate both children and adults regarding the Washbrook Watershed and promote a sense of stewardship of nature. The trails are a place to learn ‘in and about nature’.